We pride ourselves on working personally and effectively with our clients in order to achieve the most success. Through the combined talents of our team, we leave client overly satisfied. We listen, we care, and we want to continue relationships into the future. Our unique strategy redefines what architecture represents and further represents our business mission. our purpose goes deeper than just achieving goals; we strive to leave a positive experience with whomever we work. In the process of business manufacturing and producing goods, strong principles and environment consideration for each project are required. SIPCA Secure Ink Corp. is a specialty ink manufacturer. They make ink for various clients, including the Federal Government. This project included the code analysis, design, construction documents, and limited construction administration for a new 13,000 sf. 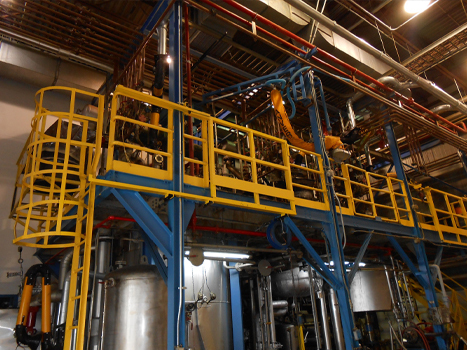 manufacturing facility in Springfield, VA. Key components of the project included high hazard use mitigation, office areas, retaining walls, high levels of security, and other site-specific requirements. 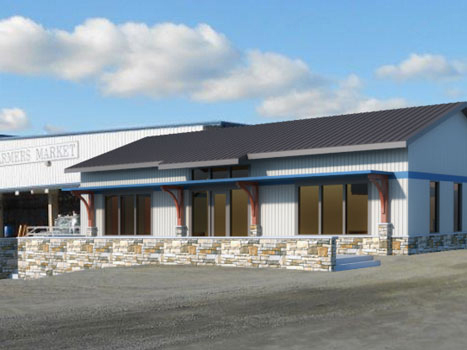 This project was an addition and renovation to an industrial-use, large scale metal building. The construction had to be phased to accommodate year-round operations. The office addition/expansion had to take into account a change of use from the original function. The materials had to be durable, aesthetic, and affordable. Consumers and their image are significant to our services for offices, corporations, and distribution centers. We understand the value of spacing and work closely with our clients to accommodate all their needs. This project consists of 14,000 GSF of retail, shop, storage and office space located in an existing strip shopping mall. Services included programming, design, construction documents and Construction administration. 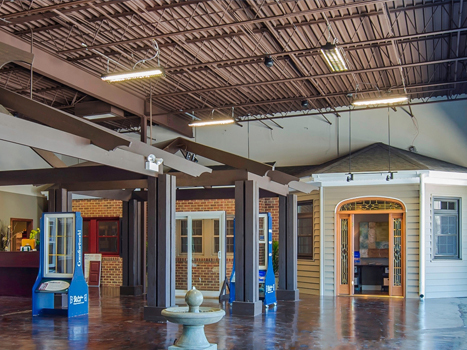 Key design features included laying out and designing the flow and racking systems for the “Just in Time” deliveries of windows and doors for their clients. Careful consideration had to be given to flow of public and private traffic patterns. 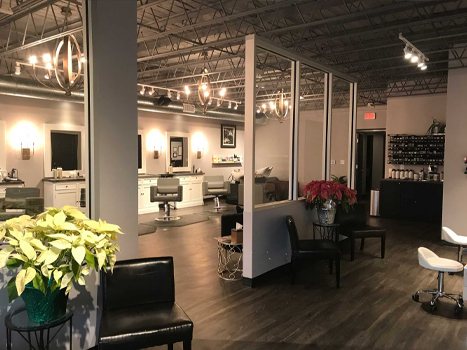 This project included full service design and construction documents for a vacated space in an existing strip shopping center. The existing space presented several challenges such as uneven floors, multiple construction areas, and completely outdated building systems. Additional challenges included a firm budget and hard completion date. The project was a success as it was completed on time and at budget. Functionality and technology are key factors to our hospital and campus clients. We focus to reach all requirements and support our clients with solutions that correspond to their concepts. The new dialysis wing at the VA hospital in Richmond, VA is a 17,900 sf. 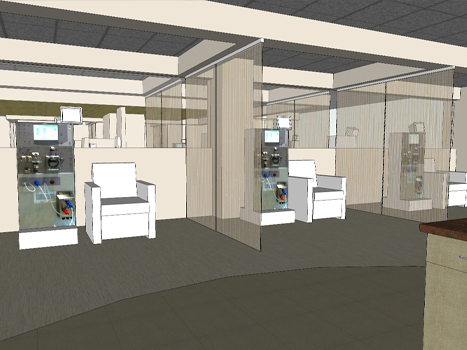 state of the art dialysis center consisting of 30 dialysis stations in a pod configuration. The unit was designed to provide maximum comfort and flexibility to the patient while maximizing staff sight lines and efficiencies. Comfort is maintained by giving the patient the ability to control the sound, sights and temperature of the space around them. Collapsible glass walls flanking the patient on each side, variable lighting and individually controlled HVAC systems were included. Due to the existing hospital configuration, a rooftop garden was designed into the plan as a barrier between the adjacent ICU wing and the new dialysis unit. 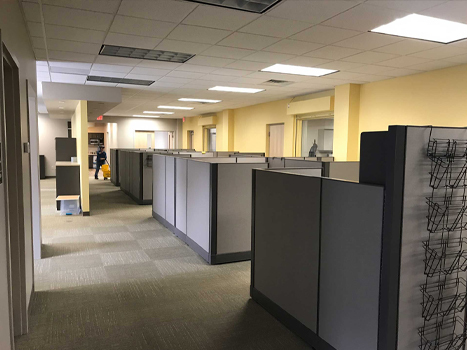 The project includes the fit out of shelled space on two floors for research wet laboratories in the Research Office Building (ROB) at the Veterans Administration Medical Center in Pittsburgh. Design and construction documents services were performed while the main building was under construction. Large open labs offer both efficiency and flexibility. The lab space provides badly needed laboratory work space. Casework in the open lab area consists of adjustable and movable cabinets. The adaptable cabinets have power/data raceways and lab gas services which are fed from overhead ceiling panels. The project included complete support services for HVAC, controls, plumbing, fire protection, power, emergency power, lighting, fire alarms, and telecommunications. Owner required redundancies were accommodated for certain specified services. HimmelHume is a commercial architecture firm specializing in design, consulting, and construction management. With over 8,500,000 square feet of commercial construction completed, our experience includes Corporate, Industrial, Government, Medical, Institutional, and Retail. Headquartered in Richmond, VA and serving the Virginia and North Carolina regions, we approach each project as a partnership with the building owner or property management team. Our goal is not only to meet, but to exceed the expectations of the client.